Electrical discharge machining is a machining method primarily used for hard metals or those that would be very difficult to machine with traditional techniques. EDM typically works with materials that are electrically conductive, although methods for machining insulating ceramics with EDM have also been proposed. EDM can cut intricate contours or cavities in pre-hardened steel without the need for heat treatment to soften and re-harden them. EDM is often included in the non-traditional or non-conventional group of machining methods together with processes such as electrochemical machining (ECM), water jet cutting (WJ, AWJ), laser cutting. In wire electrical discharge machining (WEDM), also known as wire-cut EDM and wire cutting , a thin single-strand metal wire, usually of copper or brass, is fed through the work piece, submerged in a tank of dielectric fluid, typically deionized water. Wire-cut EDM is typically used to cut plates as thick as 300mm and to make punches, tools, and dies from hard metals that are difficult to machine with other methods. The wire, which is constantly fed from a spool, is held between upper and lower diamond guides. The guides, usually CNC-controlled, move in the XY plane. On most machines, the upper guide can also move independently in the ZUV axis, giving rise to the ability to cut tapered and transitioning shapes (circle on the bottom square at the top for example). The upper guide can control axis movements in XYUVIJKL. This allows the wire-cut EDM to be programmed to cut very intricate and delicate shapes. The upper and lower diamond guides are usually accurate to 0.004 mm, and can have a cutting path or kerf as small as 0.12 mm using Ø 0.1 mm wire, though the average cutting kerf that achieves the best economic cost and machining time is 0.335 mm using Ø 0.25 brass wire. 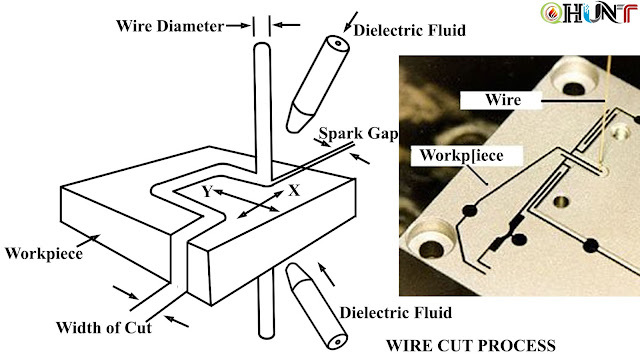 The reason that the cutting width is greater than the width of the wire is because sparking occurs from the sides of the wire to the work piece, causing erosion. This "overcut" is necessary, for many applications it is adequately predictable and therefore can be compensated for (for instance in micro- EDM this is not often the case). Spools of wire are long as 8 kg spool of 0.25 mm wire is just over 19 kilometers in length. 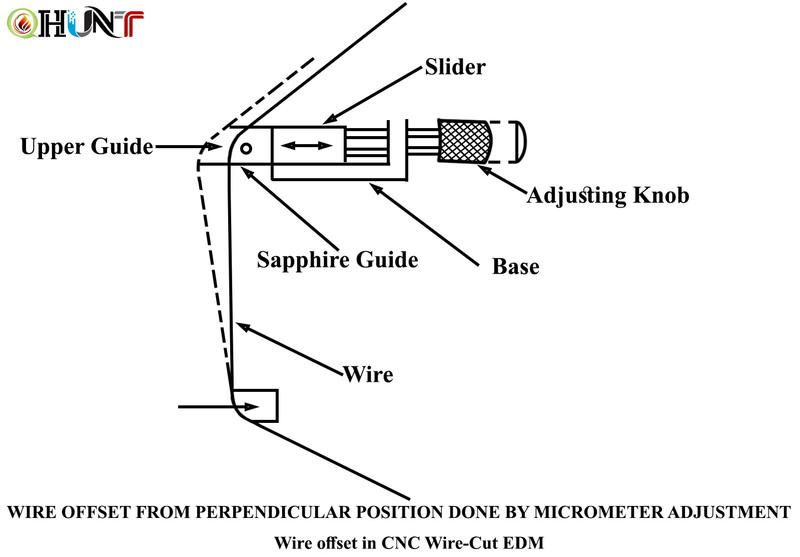 Wire diameter can be as small as 20 μm and the geometry precision is not far from +/- 1 μm. The work piece may undergo a significant thermal cycle, its severity depending on the technological parameters used. Such thermal cycles may cause formation of a recast layer on the part and residual tensile stresses on the work piece. I read your article. This is useful. Thanks for sharing.